I am determined to start, and post the Sunday Poem up this week while there is still daylight left, and so stave off any terrible mishaps. I have had a real roller coaster of a week with amazing highs and lows. My first full-length collection has been officially launched which was definitely a real high, but in the run up to it I managed to torture myself into sleepless nights and nightmares that nobody would show up to the launch and I would be reading poems to the band and my parents. I mean, there are nine people in the band, so adding my mum and dad, I’ve done smaller poetry readings and been an audience member in smaller readings as well. Last week I was moaning on to Chris and asking myself why I’d organised such a large thing. Whose idea was it to have it in the Supper Room which is quite a large room to fill? (mine) Whose idea was it to have the Soul Band playing, thus making everything much larger? (mine) And why in gods name did I tell people to bring food? What if there wasn’t enough? I was also panicking about the audience. I suspected the poets would be outnumbered by the runners, soul band fans, teachers and musicians and might not have any interest in poetry. What do you read to people that might not have any interest in poetry? I was also worried about how people would react to the soul band. I wanted the band to have a good night, as they agreed to play for free and most of them are gigging musicians so this meant a loss of income to them. I was worried that the poets would think it was too loud and go home after the poetry. I was worried about the turnout as well because lots of people who said they could come then got in touch to say they couldn’t make it for a variety of reasons. I was worried about Amy Wack, my editor at Seren coming all the way from Wales and being disappointed in the turnout. So, that was me, worrying away before the launch. Chris alleges that I do this before EVERYTHING – that I worry myself into a sort of worry-frenzy and it always turns out ok, so maybe it is just the way that I cope with things. Amy arrived on Wednesday and it was then I started to calm down a bit as I realised it was too late to do anything about any of the things I was worrying about anyway. On Thursday we went for a walk with the dogs and then went for lunch with my auntie and uncle who had come all the way up from Leicester to be at the launch. I don’t see them very often so it was really nice to spend some time with them. After lunch I drove to Ulverston for a quick sound check with the band at the venue and to put out the table cloths that I’d borrowed from Poem and a Pint. So there wasn’t any time to worry on Thursday, and before I knew it, it was 7pm and people were starting to arrive, first of all in a trickle, but then there was suddenly a queue outside the door to get into the room and there was no room to sit down and we were having to get more chairs. I’ve put some photos into this post in a rare move for me to show you what I’m talking about. It was a bit like getting married without having to share the limelight with a bloke! 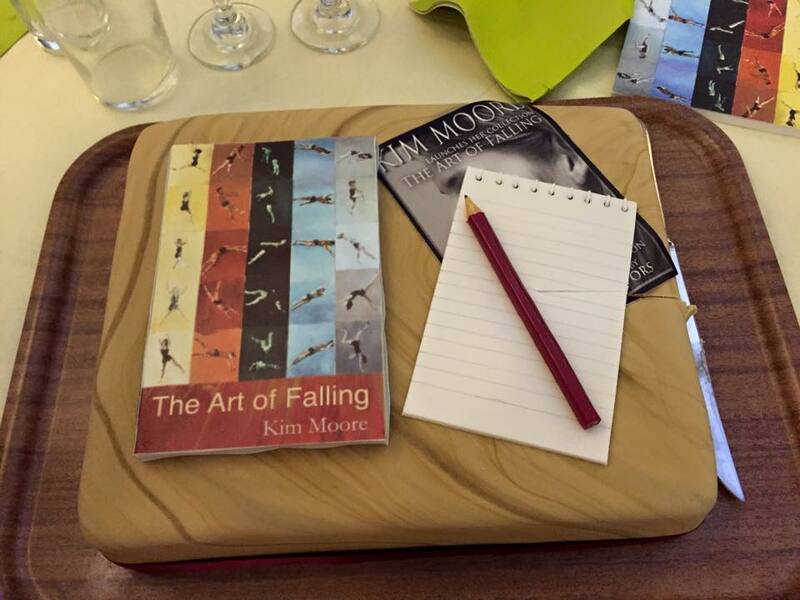 My lovely friend Jo Stoney made me the most amazing cake, with the cover of my book made out of icing. We even had a cutting-the-cake ceremony like you do at a wedding! Here is Jo and I about to cut the cake. Here is a photo of the crowd at the launch – there was a group from my running club, some of whom had never been to a poetry reading before, teachers that I work with in schools, parents of kids who play in my band, Chris’s friends from work and psychotherapists that he works with, my family and of course the lovely poets who I spend a lot of time with these days. Some of them, like Jennifer Copley and Mark Carson and Gill Nicholson I’ve been in writing groups with ever since I first started writing seven years ago. Others I see more sporadically at events and workshops and open mics. I was completely stunned by the turnout – I’m not making it up when I say I didn’t think there would be many people there. It was an amazing atmosphere to read in and although I was too busy talking and signing books to get any food apart from a couple of crisps and a carrot stick, I’m told there was plenty. After the food, I had a quick costume change into the black that the Soul Survivors play in and we went on and started playing. I needn’t have worried about the poets reaction to the music either. They lost no time in getting up and gyrating about the place. 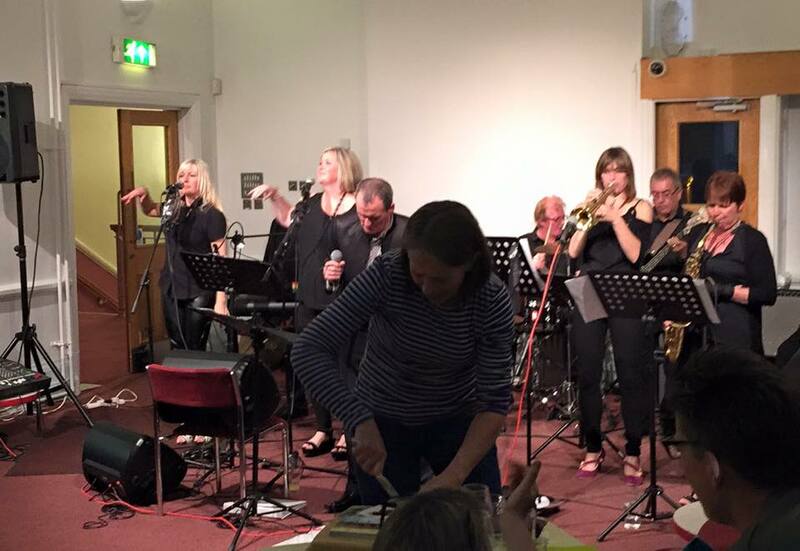 Here is a picture of the band and I’ve just noticed Jo is cutting the cake at the front of the photo! When the pamphlet came out, I kept a sporadic but running total of my own sales, so I’ll do the same for the book. In the run up to the launch, I’d sold 51 copies. At the launch Amy sold 68 which I thought was pretty good. I’ve decided not to sell the book from this blog, as postage is more expensive than for my pamphlet, and if you buy direct from Seren, you will get 20% off as part of their book club deal. My next, and last launch event for the book is going to be in London at The King and Queen pub, 1 Foley Street, W1W 6DL on June 13th, starting at 7.30. I’ll be reading with Jill Abram and Kathryn Maris. Sadly, the budget won’t stretch to transporting the nine-piece soul band to the venue but I will try and make up for it. There is a Facebook group for the event here and it would be lovely if any London readers could make it there – do introduce yourself if you come along! Apart from obsessing about things that are out of my control I’ve also played at a wedding with the Soul Survivors on Friday night and on Saturday morning I knocked seven seconds off my Park run personal best time, taking my best time down to 23 minutes and 1 second! Highly annoying not to get under the 23 minute barrier but it seems well within reach now. Of course once I do that I will start obsessing about getting under 22 minutes but, you know. It keeps me busy. So that is more than enough about me. Today’s Sunday Poem is by Basil du Toit, who is another Poetry Business pamphlet winner. I was really impressed with his quiet yet assured delivery at the pamphlet launch and I really enjoyed reading his pamphlet once I got home. The poem I’ve chosen, Sound Engineer, is one I love firstly because of its sure footedness. It tells you exactly where to breathe because of the line breaks – it is like reading a musical score. It’s an interesting subject for a poem as well and I love how it succeeds in making the voice a physical object that can be manipulated and changed, snipped and cut. It also draws attention to the things that surround our speech and our words, the swallows, glottal lumps, the ‘tiny puff’ of a sigh. Maybe this is why it is so easy to fall in love with poems – on the page or spoken aloud, if they are read well, there is no room for any of these vocal sounds. The contrast between the two people in the poem is very marked as well. The Sound Engineer is a ‘language beautician’, a ‘word surgeon’, whereas the owner of the voice has ‘ugly glottal lumps’ and ‘noisy swallows’, ‘gristly blurts and mishaps’. By the end of the poem, the speaker has been transformed ‘speaking like an angel’ but the poem finishes with that striking image of the feet of the sound engineer, surrounded by the ‘phonic fragments’ of his voice. I might have just been reading too much of Ovid’s Metamorphoses recently, but there is something in this poem that reminds me of the story of Philomena, whose tongue is cut out by her sisters’ husband, but the tongue continues, almost with a life of it’s own. There is something painful in this ending, as if getting rid of the ‘acoustic transgressions’ has removed something vital from the speaker, something important. gristly blurts and mishaps from my delivery. puff – intact into a different utterance. like someone transplanting a cornea. or punching tracheotomies into sentences. continue to gulp and hiss and croak. I had a bit of a disaster with last night’s post. I got back from my reading at the South Yorkshire Poetry Festival and frantically began typing, having completely forgotten what day of the week it was (yes, who knew that was possible?) In fact the only reason I remembered at all that it was Sunday was because poet Jill Abram posted on Facebook that she was waiting up for the Sunday Poem. I got back to Suzannah Evans’ house, where I was staying for the weekend and started the blog post. I finished it in bed and thought I’d published it, but I woke up this morning to find it had completely disappeared. It is a mystery as usually unfinished blog posts can normally be found in a draft folder where they are automatically saved on WordPress but there was no sign of it. I don’t suppose it was a wonderful post anyway, being written at midnight but I’m more upset because I’ve broken my resolution to try and post a poem every Sunday, so that’s annoying. However I’m sure my readers will be forgiving and I will be back on time and organised next Sunday. The reason I forgot what day it was is because I’ve been in Sheffield since Saturday. I haven’t been to a Poetry Business Writing Day for at least six months and I’ve really missed going. This is the first one in six months that I’ve actually been able to make. I had a really nice time at the workshop and wrote a few things that I could develop into poems. Afterwards I went with poet Lindsey Holland to get something to eat. After dragging Lindsey around the streets of Sheffield with her heavy bags we finally found a Cafe Rouge and sat outside to have something to eat. After Lindsey looked a bit alarmed when I asked for half a Stella, I decided to try a Hoegarden which is what she was drinking and it came with a slice of lemon – my first time having lager with a lemon in so I am now, surely, officially Very Posh. Afterwards we headed over to the Open Mic at the South Yorkshire Poetry Festival, hosted by James Giddings. I was a bit worried as two minutes before the open mic was due to start, there were only about four people in the audience, then suddenly lots of young people appeared as if by magic and the room filled up. James was a great MC – very funny and spontaneous and I really enjoyed the two poems that he started and finished the night with. On Sunday Suzy and I went for a walk through the various parks of Sheffield which seem to just keep going and going forever. We both got a bit carried away and managed to break Suzy whose ‘fascist foot’ (her words not mine) started to hurt. I would love to say I gave her a firemans lift/piggy back to the flat but sadly no, she had to limp back unaided. I was reading in the last night of the festival with Andrew McMillan and Ian McMillan. I don’t know which of the two was more excited about seeing the advance copies of Andrew’s collection. Andrew hadn’t even seen it – in fact he had to buy a copy of his own book so he could read from it. This seems to happen to poets a lot – the books arriving in the nick of time I mean. Anyway, the book is very beautiful and has a beautiful naked man on the cover which Andrew tells me is Definitely Not Him. It was also interesting hearing Andrew and Ian reading together. They obviously are very different in their writing styles and their approach to poetry but I think they have some common ground as well. Andrew’s first collection is about masculinity and exploring masculinity. Ian says he likes writing about language and politics, but he didn’t mention masculinity, but I think a lot of his work does explore it as well, but in a different way. I loved Ian’s poems about someone who lives near him called ‘Norman’ and would love to see a whole pamphlet of Norman poems. I got to see quite a few friends that I haven’t seen for ages – lovely Noel Williams and Jim Carruth were there in the audience which made me feel less nervous. On Friday Brewery Poets put on a reading at The Brewery in Kendal. The guest poets were Andrew Forster, Jane Routh and Ron Scowcroft who were all excellent as expected. Two of the young writers from Dove Cottage Young Poets came along to the reading as well. It was lovely to hear some new poems from Andrew and to see him getting a chance to be centre stage after all the work that he does organising poetry events and providing opportunities for other poets. Jane Routh was the consumate professional as usual, well prepared, engaging and with a lovely calm reading style. Ron read from his very recently published Wayleaves pamphlet – another poet that I’m hoping to nab a poem from for the blog in the next few weeks or so – I particularly liked his poems around the Falklands War. We had the wonderful singers The Demix performing as well which seemed to go down really well with the audience. On Wednesday I had my first live chat with my Poetry School online workshop group. I decided to make handwritten notes on the poems and then touchtype comments during the live chat which I think worked ok except that it was quite full on and I couldn’t take my fingers off the keyboard. I’m going to try a combination of cut and paste and touchtyping this week and see how I go. They are a great group though and I’ve just had a peek at a few new poems that they’ve written for Assignment 2 and some revised versions of poems that they have written after getting feedback and I’ve been blown away again! Before I tell you about the Sunday Poem, I want to remind you all about my launch which is taking place on Thursday, May 28th at 7.30pm in the Supper Room of the Coronation Hall in Ulverston. It is free to get in but please bring some food because we will be having a ‘Jacobs Join’ after the poetry and before the Soul Survivors start playing. I’ve been having anxiety dreams about my launch and when I say dreams, I mean actual nightmares about nobody turning up. Does this happen to other poets? When the pamphlet came out, it was at the Wordsworth Trust so all I had to do was turn up but this time I’ve organised it, which has meant it has grown into an epic poetry-food-soul night evening of course. I hope if you are within striking distance of Ulverston that you are coming – it will be lovely to see you and if you’re not, please don’t tell me as it might bring on another nightmare. I know it’s the polite thing to do, but I’d rather not know! Paul’s pamphlet Those People was a winner in this year’s Poetry Business pamphlet competition. You can order Paul’s pamphlet from The Poetry Business. I have two poems that have the word ‘people’ in the title. The ones in my collection are My People‘ and Some People and I was instantly drawn to Paul’s title poem which is ‘Those People’. I like any poems that deal with ‘people’ as a generic group. Paul’s poem is playing with stereotyping when he asks in the first line ‘What are they called? Those people who turn up/unfashionably early’. I love the direct way he addresses the reader in this poem. It feels like all the way through he is looking us in the eye, talking to the reader and he continues to qualify himself in the poem: ‘I mean the opposite of stragglers’ and ‘I’m talking eager beavers’ – each of these lines is an attempt to define what he really means, or to find a word for ‘Those People’. 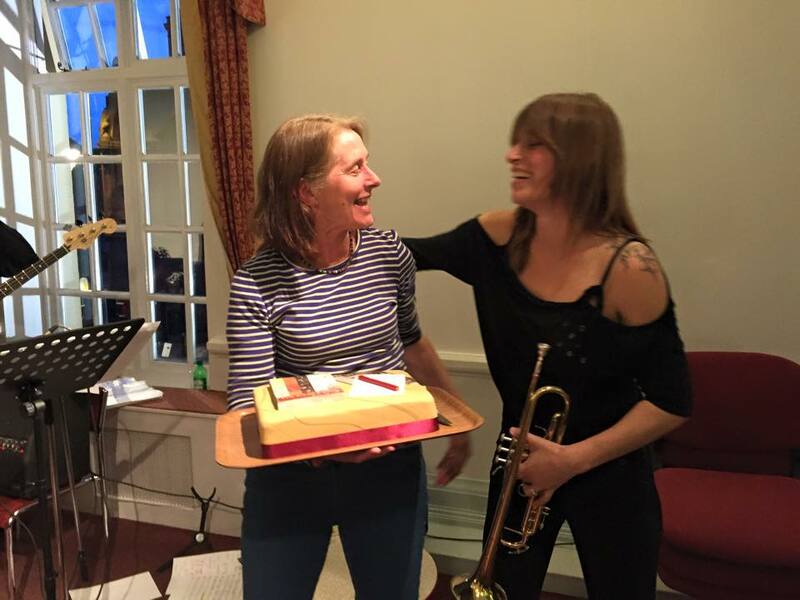 I think the poem is funny – it made me laugh out loud when Paul read it, but I also think there is a sadness and loneliness in it as well: ‘Those folk who don’t often get to go to parties’ which then made me feel a little mean for laughing. I like poems like this that upset our expectations, or make us feel one way and then another. I hope you enjoy the Sunday/Monday poem and apologies again that it did not arrive yesterday. of the party, swaying by a bucket of orange punch. of the dress code, opt to play it safe and wear jeans. I never know how to start these blog posts, not because I don’t know what to say, but I often don’t know where to begin. Should I start with what is freshest in my mind, which is what’s happened today, or start at the beginning of the week and proceed in a logical order? I’ll start with today, because nothing particularly interesting happened at the beginning of the week. I can now declare (in case you were interested) that I am injury free! My rather inconvenient and very annoying inflamed tendon in my leg has left the building and I am very happy about it. Today I did my longest run since being injured, nine miles at a relatively steady pace with the Walney Wind Cheetahs and my tendon didn’t have anything to say for itself. My leg muscles in general were really sore from the training I’ve been doing this week, but it was kind of a sweet pain, rather than an injury pain. The kind of pain that comes from working your muscles rather than destroying them. At least I hope that is what it is! After the run I came straight back, no dallying at the cafe for me today because I had lots of work to get on with. I had two friends that have been waiting for email replies regarding poems they had sent, I had an invoice to send and Sunday Poets to hunt down. I normally write to people in small groups to gather Sunday Poems so today I wrote to four poets and got their permission to use their poems on my blog so I now have four weeks of grace where I know whose poem I’m going to use on the blog. This is all quite time-consuming – but it is probably my favourite part of doing this blog. Most poets are so happy that someone, out of the blue has said that they like not only their work, but a particular poem, that it makes it completely worth it. Apart from these smaller jobs I also had three larger jobs to get done today – this blog being one of them. The other is printing out and making notes on the poems that have been submitted for Week 1 of the online Poetry School course I’m tutoring and the third job was editing reviews that have come in for The Compass magazine and then writing to the reviewers to check that they are ok with suggested changes. I’m feeling pretty pleased with myself for managing all of this today, and remembering to feed myself (boiled egg and toast at lunchtime, thai takeaway in the evening!). I’m going to jump back in the week now to Wednesday, which was the open mic at Zefferelli’s in Ambleside, run by Andrew Forster and the Wordsworth Trust. For the second week in a row I’ve had a house guest – lovely Lindsey Holland has been staying at my house since Wednesday evening because there are lots of poetry events in Cumbria that she wants to go to – open mic on Friday and a reading on Saturday. There was a great turn out at Zeff’s this week – probably because Pauline Yarwood was the featured poet. Pauline can often be found in the audience of various poetry events and workshops so it was nice to see her being given the chance to read her own poetry and lovely to be able to listen to her doing a longer reading of her work. On Thursday I spent the morning writing references for two people who are applying to do an MA in Creative Writing and then I had to go to a meeting to do with work in Milnthorpe. On the way back I came as close to dying as I ever have before when a complete idiot was overtaking a caravan on a corner and driving straight towards me on my side of the road. I have no idea how I missed hitting him because that stretch of road is not narrow enough to get three cars past, let alone a caravan but somehow I did it. I didn’t even have time to be scared, I just had to wrench the wheel to the side, and then it was done. It should have been a head-on crash and I don’t know how anyone would have walked away from it. This sounds a little dramatic, and as it happens, nothing happened. Everyone was ok, I was ok, I wasn’t even that shaken really but I was trying to think if there was anything I would have regretted not doing if something had happened and I couldn’t think of anything, so that was quite reassuring! I went to my first interval training session in about 15 years on Thursday evening, hence the sore legs all day Friday and the still sore legs today. On Friday Lindsey and I drove to Manchester. I was meeting Rachel Mann, poet and vicar to talk through arrangements for the judging of the Manchester Cathedral Poetry Prize. I think a lot of people might be put off entering this prize because they think you have to enter a ‘religous poem’, but I will be interpreting this broadly! The most important thing is to find some excellent poems. I don’t know if Rachel knew how obsessed with tea I am but we met in Propertea, which is just next to the Cathedral. When you order your cup of tea you get a little timer to use which tells you when your tea has brewed perfectly. I would have quite liked to steal the timer, except I realised I would have to steal all the paraphenalia, the two teapots, the tea strainer, and some tea leaves to make it worth it. I don’t think the timer would have worked with a PG Tips teabag. Of course this is a JOKE. I would never steal a tea timer. After that, I went to the glorious bookshop that is Waterstones on Deansgate with its fabulous poetry section. Sadly, I couldn’t find a copy of my book in there – maybe it sold out by the time I got there! However, I did go a bit crazy and buy lots of other poetry books: Here Comes The Night by Alan Gillis, Paralogues by Evan Jones, Loop of Jade by Sarah Howe and Maninbo: Peace and War by Ko Un. I’ve been wanting Loop of Jade for a while but the other collections I didn’t specifically go in for, I just brought them after browsing, which proves that bookshops need to keep their poetry sections stocked up for hopeless addicts like me who will spend far too much money if the books are there to look at. After that, we drove to Kendal to Abbot Hall Art Gallery who were having their ‘Night of a Thousand Selfies’ event as part of Museums at Night. As part of the event I was asked to organise and compere an open mic night but this was an open mic with a difference. First of all it was in a gallery and there was something wonderful about reading amongst all the portraits that made up the current exhibition. There was also free pizza from a stand outside, a temporary tattoo artist, a photo booth and a band in different parts of the gallery. The first two open mic sessions were fairly traditional. I divided the fourteen readers into two groups and half read in the first set and half in the second set. After the second open mic session we had a ‘lets see how many poets we can fit in a photo booth’ session – the answer was five and a half, especially if one insists on wearing a large horse’s head and taking up lots of room! For the third set, I decided it should just be a free-for-all as everybody had already read once and this turned into poetry’s version of The Hunger Games, where poets raced each other to the mic, running up to the front before the audience had finished clapping the last poet. It was great fun and my young writers rather brilliantly and cheekily got up twice to read, which drove the adults to be much more active in their leaping for the stage. After that, we drove up to Grasmere for the launch of the Poetry Business Pamphlet winners. This is always one of my favourite events of the year. It’s free and I like seeing what colour the pamphlets are and seeing Peter and Ann. This year was a little bit sad for me because my wonderful friend and poet David Tait was one of the winners with his pamphlet Three Dragon Day but he couldn’t be at the reading because he was in China, busy working. Peter and David asked me if I’d read David’s poems for him, so I did get to relive what it was like to win the competition, but without having to do any of the work, like actually write the poems. Reading the poems out was a strange experience, because I couldn’t do any introductions for the poems, because I wouldn’t have known what to say, so I just read them one after the other. It is a little like walking in another person’s shoes. Luckily, I knew David’s poems pretty well, and he gave me a set list of what he wanted me to read. The poems are extraordinary. They conjure up such a vivid picture of what it is like to live as a foreigner in China – they are funny and sad and frightening and moving. The other winners were Paul Stephenson who has been long overdue a pamphlet, Luke Samuel Yates who I met and read with in Aldeburgh two years ago and Basil Du Toit. I’m hoping to feature work from all four on this blog in the next few weeks or so, but I thought I’d start with David’s work. I didn’t read this poem yesterday at the launch, it wasn’t on David’s list of poems for me to read but it is one of my favourites in the pamphlet. This is one of those poems that moves from funny to shocking to sad and he does this almost effortlessly. I love the list of different things that the class bring in, and there is something moving about this list of objects. For most of the objects we are not told why they care about them. I laughed out loud when I first read this and got to the line about the lady bringing in her husband, who then sits ‘sipping lemon tea’. A lot of the poems which seem lighthearted have this sense of menace hanging over them and a sense that history and politics are somehow closer and more vivid in this country, more dangerous. We are left thinking about The Great Leap forward, and wondering if the family survived as well as the photo. I think it’s a brilliant poem and packs in a lot in a short space. David was a winner of The Poetry Business Pamphlet Competition in 2010 with his pamphlet Loves Loose Ends, judged by Simon Armitage and he then went on to publish his first full length collection Self Portrait with the Happiness with The Poetry Business in 2014. This collection was shortlisted for the Fenton Aldeburgh First Collection Prize. He received an Eric Gregory Award and now lives in Guangzhou in China, where he teaches English. You can find more information about David on his Author Page on the Smith/Doorstop website. This week I’ll be reading at the South Yorks Poetry Festival in Sheffield next Sunday night with Ian McMillan and Andrew McMillan which I’m really excited about – I hope to see some of you there. they left her after joining school. One lady has brought in her husband. He sits in the corner sipping lemon tea. the only surviving photo of a family. her father’s hands gripping her shoulders. It feels like I’m writing this in a completely different country to the country I was writing in last Sunday. I’ve gone through all kinds of emotions since the election – I stayed up till 1am to watch the first couple of results coming in but decided to go to bed when my hands started shaking strangely from tiredness – does anybody else get that? Friday was so depressing – I’ve never felt this upset about an election result. I suppose the few good things that have come out of it is that Nigel Farage has lost his seat and the Tories will now have to shoulder the blame for their policies instead of the Lib Dems taking the fall. I shudder to think what Michael Gove is going to do to the Justice Department after the impact he has had and is still having on education. Anyway, I don’t want this whole post to be about politics although it will wind its way back there by the end. I’ve actually, apart from the horrible election had a nice week. It was a bank holiday on Monday of course so I spent the day preparing the first assignment for my Transformation course that I’m running for the Poetry School. It’s an online course which means that all the things I waffle about in a face to face workshop have to be written down and made to sound like I know what I’m talking about. I’ve used extracts from Ovid and poems by Liz Berry and Wendy Pratt to illustrate points I’m trying to make for this first assignment. On Tuesday I went to Grasmere to see Paul Muldoon read. This was the first of this year’s readings at the Trust. They are putting on a few readings whilst they wait to hear about the outcome of a grant application. I would urge any poets in the area to do their best to show support to the Trust by attending the readings and showing how much the reading series is valued. Apart from that, the readings are excellent I’ve never seen Paul Muldoon read, or heard him read, I should say and I thought he was wonderful. I wouldn’t say I’m really a fan of his work, although I like the earlier stuff, but his performance and his engagement with the audience completely won me over, and I’m returning to his collections now to have another go, now I’ve got his voice going round in my head. My lovely friend Lindsey Holland has been staying over this weekend. I’m trying to persuade her to move to Barrow and live in my spare room and cook me dinner every day but so far she hasn’t given in and agreed. I suppose I could kidnap her. We went for a Thai in Ambleside after the reading – only just nipping in before they shut because we practically fell on our knees and begged them – a little dramatic I know but these things have to be done. On Wednesday I had a rehearsal with the Soul Survivors but Lindsey made an amazing pasta and meatball concoction, thus securing the lifetime offer of my spare room for free in exchange for meals. On Thursday we went to Dove Cottage Poets, run by Andrew Forster which was a great session. The theme was writing about strong emotion and Andrew brought an interesting selection of poems by Rebecca Goss, Tim Liardet and Imtiaz Dharkar. I had rehearsal with my brass ensemble on Thursday night. I haven’t done much running at all this week – I did a fifteen minute blast up and down the hill on Tuesday before leaving to Grasmere – purely because I was in a bad mood and I wanted to get rid of it and physically exhausting myself seems to be a good way to clear my head! I also went for a run with Chris yesterday – only 6 kilometres but at a pretty good speed and I beat him up the hill – these things are important to me! I’m planning on getting back into running this week when I will hopefully have a bit more time. Today’s Sunday Poem is going to be a little bit different because I’m featuring Lizzie Briggs AND Beth Latham – two of the young writers from Dove Cottage Young Poets. These poems are very fresh – they only wrote them last Friday at the Dove Cottage Young Poets workshop – the day after the election. I was feeling upset, angry and depressed about the results – and frightened, for those of my friends who are vulnerable for whatever reason. I think life is going to get harder for them. However, this is not a political blog, and you already have to put up with me wittering about running when you signed up for poetry, so I won’t say too much on it except to share these two poems by Lizzie and Beth. I loved Beth’s poem as soon as I heard it. You can hear how well-read she is with the nod to the famous Wilfred Owen poem in her title, but I also love it because it confounds our expectations in the middle – we think it is a sympathetic poem for Ed Balls – and in a way it is. Perceptively, she points out ‘the set of his mouth gave him away’ but then she reverses this and finishes with a good dose of cynicism and a dash of humanity thrown in. I’m always suprised by the level of awareness that the poets I work with in the young writers group show – mainly because I was completely politically unaware at that age – I had no interest in it at all – but they are completely clued up. I’ve just spent the day with the group in Westmorland Shopping Centre in Kendal in a pop up shop to try and recruit some more members for the group so we’ve had a whole day of writing poetry. We also spent time (or they did) typing up the many, many drafts of poems that they’ve been hoarding in their notebooks and it was really exciting for me to read the next stage of poems that I remember them writing in a workshop. Lizzie’s poem has her trademark sense of humour in it – we are already referring to this as her ‘jim poem’. I love the character of Jim and the way he is created purely through his speech. I like the sarcasm in ‘no jim that’s the scottish jim’. In fact I can see a whole set of ‘jim’ poems developing. Again, there is a lot of knowledge in this poem which I certainly didn’t have age 17 – how to vote, the voting age in Scotland and England, the resignations that happened after the vote – all worn very lightly and I know she didn’t have to google any of it because she wrote all of that in the workshop. Lizzie is however, the queen of random facts so it shouldn’t surprise me at all that she is clued up on politics. Apparently, in their school, the election was the hot topic of the day, which I think is wonderful. As far as I know, these are Lizzie and Beth’s first published poems, although last year Lizzie was Commended in the Foyle Young Poets Competition, meaning her poem was placed in the top 100 out of 7000. Here are Lizzie and Beth’s poems – hope you enjoy them. Ed Balls lost his seat today. but the set of his mouth gave him away. Today it feels much longer than a week since I updated my blog – maybe because it has been a really exciting week. First of all I did my first public reading from my new collection. Although I did read from it whilst tutoring on the residential course I was running with Carola Luther in Grange over Sands, that was to a small audience of 17 people and it was a lovely, intimate atmosphere. This time I was reading at the Heart Cafe, in Leeds – it was still a lovely, intimate atmosphere, even though there were maybe 30 or so people there – the room was full with just enough chairs for everybody. It was a really special evening, not least because it was a bit of a repeat of history. In 2012, the night before my official pamphlet launch at The Wordsworth Trust, Peter Sansom drove specially over to Leeds to drop off a box of my pamphlets at The Heart Cafe so I could do a pre-launch reading there. I got stuck in traffic, and by the time I’d got there, David Tait had already sold about 20 copies of my pamphlet. Peter White, who now organises the readings had bought the first copy and came straight up to me and asked me to sign it. The box of books has been living under my desk for the last two weeks, since their brief outing into the world at Grange. I’m not quite sure why, except after that initial impulse to read it cover to cover, I then couldn’t even bear to look at them. Not because I didn’t like it, but I just wanted to wait to enjoy it until the reading. It felt a bit like when I was younger. At Easter my sister and I would both be allowed to eat half of an Easter egg in the morning which we would eat really slowly to annoy each other by being the last one to have any chocolate left. It felt like if I got the book out of the box before Wednesday it would be like scoffing my easter egg in one go. Anyway, we got to the reading with moments to spare because the restaurant were quite slow at serving our food. Andrew and I basically ate a whole leg of lamb in about five minutes. I felt really bloated and was quite relieved to not have to read till later. Peter White, who organises the reading series had asked me who I would like to read with me and between us we came up with the poetry dream team of Andrew Forster, Mark Connors, Keith Hutson, John Foggin and I decided to prod Peter into reading, as he has always been a great supporter not just of my poetry, but of poetry and poets in general, and I thought it would be nice to let him have some of the limelight. I was really touched by the people who turned up to the reading. There was quite a few people that I didn’t know, but lots that I did. When I looked round the room, I realised that there were lots of poets sitting there who I’d thanked in my acknowledgements to the book, people that had read various versions of the manuscript and sent comments and feedback. Clare Shaw was there – the first person I sent the whole sequence of domestic violence poems to. If she hadn’t been as enthusiastic and excited about them as she was, I would not have sent them to Amy Wack at Seren, telling her that I was thinking of making a pamphlet out of them. Amy told me they had to go in the collection. I’m glad she did – that is what an editor is for. I can’t imagine the book without them now. It would be like its heart was missing. Ian Duhig was there and Carola Luther and lots of people that I’d met during my residency in Ilkley, people I met when I ran a workshop at Leeds Writers Circle a few years ago now, my lovely cousin Vicky and her partner Tom, who had never been to a poetry reading before and who I’m hoping are not too traumatised by the whole experience. John Foggin nearly made me cry three times – once by saying nice things about me, the second time by reading an amazing, amazing poem that I would ask to have for this blog, except that it needs to be published and reach a wider readership than I do here, and then the third time by bringing an early version of my manuscript that I sent him, that he commented on that he has had bound in beautiful leather. Flicking through it very quickly, one of the main differences was that this earlier version was back to front. Keith Hutson read a fantastic set of his poems about Troupers – these poems are going to make such a good pamphlet when he puts them altogether. It was the first time I’d heard Keith do a longer set so that was a real treat. Andrew Forster was his usual poised self, delivering a perfectly balanced reading of his work, ending with a new poem about his father, which I really enjoyed. I’m sure I’ve forgotten to mention somebody who turned up, and I apologise if it is you. It is 11.15pm now and I have till midnight to get this finished, and I’ve only half told you about Wednesday! I wasn’t going to read from the sequence of domestic violence poems because they are by their very nature a bit grim, but then when it came to it, I felt like I had to, because they are a huge part of the book. There will be readings, I think when I won’t feel able to read them, but this didn’t feel like one of them. When I’m reading them it feels like I’m standing in a black hole, but I know the way to get out, and that makes all the difference. I sold 24 books on Wednesday, bringing my total sales up to 48. This means I have to write to Seren to order another box of 100 because I’m estimating I will probably sell the last 52 by the end of May. Boxes of books are a lot more expensive than boxes of pamphlets, so here’s hoping I sell them all. Failing that, as David Tait says, they make good door stops. So, that was Wednesday! The other exciting thing that happened this week was that I took part in the Dalton 10k race. Last year when I ran this race I’d only been running for a couple of months after a ten year gap and I managed 56 minutes and 56 seconds. Six months ago, I’d managed 51 and a half minutes for a fairly flat 10k course so I figured if I aimed for as close to 50 minutes as I could get, that was an ambitious enough target, considering I’ve been injured and I’ve not been getting as much training in as I would have liked. I absolutely loved every minute of the race – and it is really, really tempting here to go into a blow by blow account of every kilometre and give you my splits for each kilometre, but I won’t because I understand, like looking at photos of other people’s children, it’s probably not that interesting for anybody else. All of those hill runs Chris has been dragging me on so he could look at the mountains definitely paid off, because I actually enjoyed the hilly course. I eventually ended up with a time of 47 minutes 42 seconds, which I still can’t believe. As in, I don’t know physically how I did that because I certainly haven’t been training at that speed or anything close to it. Oh well! On Saturday I volunteered at Barrow Park Run and then spent the rest of the day writing. I bought myself another folder and decided to go through the poems I’ve half started in the last six months and print out any with potential. Every time I tell myself I’m not writing and then it takes me six months to realise I’ve been writing the whole time, but I haven’t been organised and the poems have been in a rather scruffy looking folder. You will be glad to hear they are now arranged in my posh new folder, ready to be edited and then make their way into the world. In the evening I spent time writing up the first assignment for the online course that I’m teaching for The Poetry School, which starts next Wednesday. I actually felt like a writer for the first time in months. Not because I had a box of my own collection under my desk, or because I’d done a reading and sold lots of books, but because I was writing. I might be writing complete dross, but I was writing, for a sustained and concentrate length of time, which I haven’t done for a while, for so long, in fact that I’d forgotten how much I actually enjoy writing. Even when the poem is destined for nowhere more glamorous than the bin, I still love being in that moment of writing. Today I’ve been to Printfest in Ulverston with a friend and stocked up on lovely cards and postcards and chocolate brownies and cookies. This evening I went for a 6 mile run with two friends to try and get some of the Dalton hills out of my legs – I’m not sure if it worked, the hills were definitely still in my legs when I was running! Today’s Sunday Poem is by Stephanie Green, who I met at Stanza very briefly after going to her reading, where she read alongside D.A. Prince from her pamphlet Flout. I really enjoyed Stephanie’s reading and took the opportunity of getting my pamphlet signed to ask her if I could use one of her poems here. Stephanie moved to Edinburgh in 2000 and runs creative writing workshops and reviews Theatre and Dance. You can order Stephanie’s pamphlet from the fabulous HappenStance and you can find out more about Stephanie Green here. I’ve chosen the poem The Njuggle from Stephanie’s pamphlet. A definition in the back of the book tells me that a Njuggle is a ‘demon water horse or pony found in Shetland and Orkney folklore’. I love the story in this poem. The language that Stephanie uses, like the word ‘scry’ in the second line, seems to fit with that folklore feel and that man’s face rising in the mirror in the third line reminds me of Sylvia Plath’s poem ‘Mirror’ when her face ‘rises towards her like a terrible fish’. One of the things I love about this poem are the many wonderful words used to describe movement in it. The piebald pony ‘ambled up’. His muscles ‘shivered like water in the wind’. When the Njuggle turns into water he ‘poured through my arms’. I also love the idea of it – I’ve not heard of an Njuggle before, but the use of transformation in poetry is one I’m interested in at the minute and the story of an animal carrying off a human woman is an old and time-tested story. The other thing to point out, which I’m sure you will have noticed is the wonderfully tight structure that holds this poem together. It is very carefully put together. The first and the third line of each three line stanza rhyme and many of the second lines of each stanza rhyme as well. I’ve been reading so much Ovid recently, I can’t help thinking of it when I read this poem. Stanza 4 reminds me of Europa when she is carried off by Jove in the form of a bull, and in the last complete stanza, when the Njuggle turns into water, it reminds me of the women in Ovid’s Metamorphoses who were turned into water to escape the unwanted attentions of one of the gods. Thank you to Stephanie for letting me use this poem and do feel free to comment underneath, if you feel so moved. I looked in the mirror to scry my lover-to-be. His face rose like a drowned man’s. where the whaap’s cry wavers from the reeds. pulsed as he blew into my hand. and his muscles shivered like water in the wind. When he lowered his head, I knew I must mount. and he rolled me into cold, green fire. his shoulders encrusted with mussels and mire. whip-lashing, he bucked and shrank into a man. but dawn broke and he poured through my arms. only the widening circles on the loch.